Galileo Music Webshop: Sväng: Schladtzshe! "Schladtzshe!" is both a swear and a toast. Its meaning can be exemplified roughly as "Brothers! Let us make our mistakes with pride, for life otherwise is a mere collection of irrational occurrences. Let us empty our abundant, if sometimes bitter, drink with joy!" Thanks to their show-stopping performances at such highly regarded stages as Womex, ”Later with Jools Holland”, and the Linbury Concert Series, to mention but a few, the new harmonica quartet Sväng is no longer stranger to the international world music crowd. The ensemble is led by Jouko Kyhälä, a master musician with a doctor´s degree on harmonica, and they are known for their original compositions with depth very few would normally associate with harmonica groups. 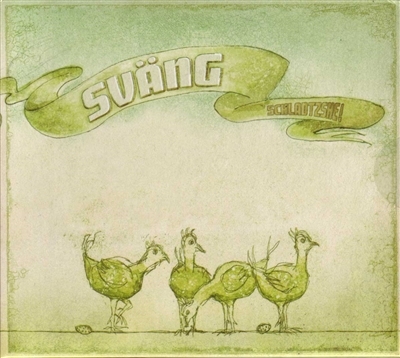 Gearing up for the release of their third album ”Schladztshe!” this fall, Sväng function on stage as a tight unit of four top-notch harmonica visionaries breathing life into one vision of music that fuses together Nordic and Balkan influences. They effortlessly make both of these musical worlds their own, plus everything in between and beyond should the occasion arise. Personality, character, professionalism, vision, and intensity are among the adjectives which could be used to characterise Sväng and their celebrated live sets. This harmonica attack from Finland has to be heard to be believed.